[Nathan] took this boombox and outfitted it for Bluetooth streaming. He took a Motorola DC800, which is meant to make headphones wireless, and connected it to the stereo inputs. The controls for the Bluetooth module were routed to the stock tape deck controls and a little bit of frosted spray paint adds a blue glow to the cassette window. Now he can stream music from his phone, including internet radio, which he’s done in the video after the break. Did he find the most annoying demo video music ever? You be the judge. Most annoying? No, but damn close. This kind of reminds me of old Star Trek music and sound effects. What would have been snazzy would be if the whole Bluetooth® module been fitted to one of those cassettes used to give you an input. 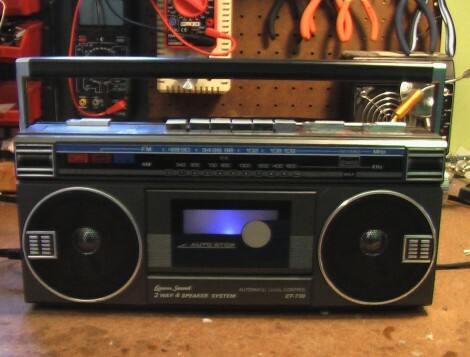 Then you have a Bluetooth® cassette tape adapter and preserve the look and sound of the stereo. I am 99.99% sure such a device already exists, I seem to recall seeing it in one of those high-end audio magazines. So it costs 100x what it was to make? Pretty cool idea – but this would only be capable of mono sound, would it not? I guess the (almost) obvious music choice for such a device would have come from the soundtrack to Breakin’ but the slowly pulsing light was telling me to put some old sci fi music on and I had the track (being played in the video) on my phone already. Yea with the electric boogaloo this would have been funky fresh! Is this what you guys were talking about when you said Bluetooth Cassette Adapter??? There must be a better place to hook into the amplifier input. Even the cheaper tape players have features that will interfere with the signal, like automatic gain control, dolby deemphasis, and the like. Maybe I’ll have to post my recent “universal boombox” project that will mount up nearly any handheld device and charge it via USB to boot! Stuff like this is really cool, especially when you end up with a really useful item. There are also special equalization curves used during tape recording that will kill the treble if you connect something to the head cables. 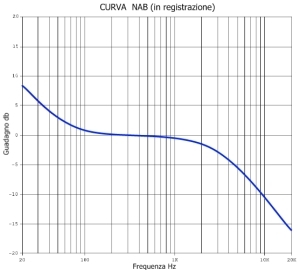 Look for NAB equalization curves. Isn’t there an impedance difference between, headphone out and tape head pickup? Not to mention tape head pickup is per-amplified which is not necessary. I cannot imagine this sounding any good.